Carpenter, Bob. 2011. Sampling, Modeling and Measurement Error in Inference from Clinical Text. Invited talk at the ICML 2011 Workshop on Learning from Unstructured Clinical Text. Bellevue, Washington, USA. It’s basically a list of the kinds of things that can go wrong and introduce error (bias and noise) into inferences. Although the examples are mostly clinical (with one on baseball and one on cancer clusters), the point is generally applicable. I really like small, focused workshops, and this one was very good, with lots of presentations on people’s practical experiences launching systems in hospitals and working on fascinating text mining problems from clinical notes. Thanks again to the organizers, especially Faisal Farooq, who handled all the paperwork. It’s a pretty thankless job in my experience, but having done it myself, I can really appreciate how much work it is to run something that comes off smoothly. When Noémie Elhadad invited me to give a talk, I met with her to see if there was a topic I could talk about. During that meeting, she mentioned how hard it had been to hire an NLP programmer in biomedical informatics (it’s just as hard if not harder at a small company). The upshot is that Mitzi got a new job at Columbia into the bargain. In a way, it’s too bad, because I miss talking to Mitzi about her work in genomics, about which I know relatively little compared to NLP. It was bound to happen. The model I was proposing for splice-variant (or isoform) expression was too obvious (and too good!) for it not to be independently discovered. Seeing my ideas discovered by others is on one hand a bummer, but on the other hand gives me confidence that I’m thinking about these models in the right way. The following paper presents roughly the same model of expression I presented in a previous blog post, Inferring Splice Variant mRNA Expression with RNA-Seq. Li, Bo, Victor Ruotti, Ron M. Stewart, James A. Thomson and Colin N. Dewey. 2010. RNA-Seq gene expression estimation with read mapping uncertainty. Bioinformatics 26(4):493–500. It also incorporates some of the features I suggested for edit distance in another blog post, Sequence alignment with conditional random fields. In fact, it’d almost be easier to say what’s different in Li et al.’s model. The expression model is almost identical, down to the name of the variable, , used for read expression. The model in this paper assumes reads, implicitly assumes an uniform prior for , then for each read , chooses splice variants . So far, identical (other than that I considered arbitrary Dirichlet priors). Things look different when Li et al. start to generate reads . What I did was assume an arbitrary distribution , with parameters characterizing the likelihood of observing read from reference source . Li et al. decompose part of in their model. First, they assume is the start position of read on reference sequence and assume is the strand, both of which are generated from the ref sequence , by distributions and . This is where Li et al.’s proposal relates to my probabilistic aligner proposal. In particular, with the position, strand and reference sequence, , the reads may be defined to be sensitive to location (say in relative position measured from 5′ to 3′), or to underlying sequence (such as the hexamer bias due to priming studied in [Hansen, Brenner and Dudoit 2010]). They only study the positional biases, and for their data, they were small. But groovy nonetheless. It’s building in the right kind of sensitivity to the biological sample prep and sequencing. What they’re not using is the the quality scores on the reads themselves (as is done in Clement et al.’s GNUMap aligner). I think there’s an opportunity to squeeze more sensitivity and specificity out of the model by using the quality scores from the sequencer (if they can be calibrated properly, that is). The aligner I propose also normalizes the edits to proper probabilities using a sum-product algorithm; it’d be easy to extend to read quality as in GNUMap, or to compose it with a color space finite-state transducer, as in SHRiMP for SOLiD reads. The other main difference is that I was proposing using Gibbs sampling to produce samples from the posterior of expression given reads and channel model and Dirichlet prior . Li et al. use EM to find the maximum likelihood estimate, . As usual, the MLE is just the MAP estimate with a uniform prior, so in my model, the MLE is . One of the main arguments I made for the Bayesian approach is that, like all truly Bayesian approaches, it supports posterior inference with uncertainty. This is very useful for doing things like pairwise or multiple comparisons of expression or adjusting for false discovery rates. Li et al. use a bootstrap estimate of standard error, which is great to see. I wish more researchers provided variance estimates. The danger with only reporting standard error (or variance) in these skewed binomials (or multinomials) is that the parameter value’s very close to the edge of the allowed values, so the 95% interval can contain illegal values. You see the same problem for normal approximations of variance for the Poisson, where a few standard deviations below the mean can result in negative counts. They run a bunch of simulation experiments to show that this kind of model makes sense. I did the same thing on a (much much) smaller scale. They use Langmead et al.’s BOWTIE aligner with up to two mismatches, which seems a rather dodgy basis for this kind of expression model. It will depend on the settings, but the defaults provide a greedy heuristic search that’s not guaranteed to be complete in the sense of finding all or even the best alignment. [Update: June 10, 2010: BOWTIE has a --all setting that the documentation to generate all matching reads, but there’s also a maximum number of backtracks parameter that can eliminate some matches if there are 2 or more edits allowed. Even if BOWTIE can be configured to find all the matches up to edit distance 2, there’s no reason to assign them all the same probability in the model or to assume that a read is accurately mapped at edit distance 2 and not at edit distance 3 or greater. What we really need is some real applications. Mitzi and I are reanalyzing the human liver and kidney Illumina RNA-Seq data described in (Marioni et al. 2008), and also some new data generated by Ken Birnbaum (and Paul Scheid) at NYU using a single-cell protocol on SOLiD on Arabidopsis roots over a 5-day period. Paul Scheid, the director of the SOLiD core facilty at NYU, just presented the data at a SOLiD user’s group meeting he hosted at NYU last Friday. The short story is that Mitzi crunched the data to show that you can use a single-cell protocol on SOLiD and use SHRiMP for alignment to derive expression results similar to that estimated from parallel microarray day using Li and Wong’s D-Chip factor model for microarray expression. The conclusion of Li et al. is that if each base costs the same to read independent of read length, then according to their simulations, the optimal read length for caclulating variant expression is around 20 to 25 bases, not the 50 or longer that Illumina and SOLiD are producing these days. Having spent hours figuring out how to properly normalize edit probabilities of an edit channel model so they sum to 1 over all reads of a given length given a reference sequence, the answer seems obvious in retrospect. Use conditional random fields (CRFs), because they can normalize anything and are easy to program. An added benefit is that biologists are used to thinking of edit costs on a log scale. Once we have a conditional model with an arbitrary linear basis, it is straightforward to account for differential expression given location or initial hexamer (more on that below). The first step in most DNA or RNA analysis pipelines is sequence alignment, wherein the bases read from a biological sample by a sequencer are aligned with the bases of one or more reference sequences (genome sequences or gene models of RNA transcripts). The present generation of sequencers (e.g. Illumina or SOLiD) produce tens or even hundreds of millions of reads of 50 bases or so per run. Typically, simpler models like pure edit distance are computed, using hashing heuristics to narrow search or suffix arrays to share prefix calculation. The model described here is intended to be run over a narrower set of alignment hypotheses. In a previous post, I described a Bayesian hierarchical model of mRNA expression. That model contains a random variable for each read that is dependent on the sequence from which it is read. Inference with this model requires us to calcluate the probability of a read given a reference sequence. The model described here directly plugs into the expression model. Probabilistic alignments may also be used in SNP calling, splice-variant discovery, or any other applications of sequence alignment. m(A), d(C), m(G), m(T), i(T), m(A), s(G,C), m(G). The alignment indicates the bases involved so that the reference and query/read sequences may be reconstructed from the alignment. m(A), s(G,C), s(T,G), m(T), m(A), s(G,C), m(G). Suppose we have a reference sequence of bases . The CRF we propose will model the probability of alignment aligning at position of reference sequence and producing a read of length . We’ll let be the read generated by the alignment . where is the potential of the edit operation . Recall that the edits include their edited bases, so we have four match edits m(Z), twelve substitution edits s(Z1,Z2) with Z1 != Z2, four insert edits i(Z) and four delete edits d(Z), for a total of 24 edit operations. So provides values in for each of the 24 operations, and the weight of a sequence of operations is the sum of the operation weights. For starting positions, we take a potential function for starting an alignment at position of reference sequence . where we take to be an indicator variable with value if and otherwise. This makes sure our distrbution is normalized for the length of reads we care about, and will also make the dynamic programming required for inference tractable. As they say in the old country, Bob’s your uncle. It’s just the usual sum-product algorithm for CRFs. Its just like the usual Smith-Waterman style edit algorithm except that (1) we must consume all the read, (2) start costs are given by , and (3) we use log sums of exponentials rather than maxes to compute cell values without underflow. 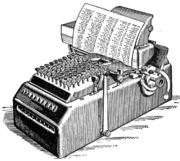 To compute the normalizing term , we run a similar sum-product algorithm, only with an extra sum for all the possible reads. With the same caveats (1) and (2) above, we can use the usual maximum operation to produce the best alignment. We can also follow LingPipe’s approach and use Viterbi in the forward direction and A* in the reverse direction to enumerate the n-best alignments. It’s easy to take affine gaps into account. Just condition the edit operations on the previous edit operation. You have to add the relevant context to dynamic programming as in the usual affine extension to Smith-Waterman alignment. It’s also easy to model things like the uncertainty caused in Illumina reads by homopolymers (sequences repeating the same base) by allowing context for the previous base. This is also easy to dynamic program, though adding context adds to space and time requirements. Depending on the sample preparation process in RNA sequencing experiments (RNA-Seq) (e.g. RNA fragmentation by hydrolysis versus oligo-primed cDNA fragmentation by sonication), there may be effects in read coverage based on position (e.g. RNA fragmentation depleted at 3′ and 5′ end or cDNA fragmentation favoring reads toward the 3′ end) or on the sequence of bases near the start of the read (e.g. amplification by “random” hexamer priming). We can also add input quality to our calculations if it’s on a log scale. Then we have to select which base was actually read, making it more like the use of CRFs for tagging. For an example of how to do this for standard edit costs, see the description of the GNUMAP system in [Clement et al. 2010]. As the authors point out, this is a serious issue with reads as noisy as those coming off the Illumina or SOLiD platforms. I’ve blogged previously about inferring gene or mRNA transcription levels. Now suppose you have several tissue samples from the same organism (e.g. from different cells or at different developmental stages or just replicates of the same experiment). These might be mapped to genes, to splice variants, or to individual exons. What we’d like to be able to do is start making inferences about genetic pathways and their activation. I wrote the simplest possible model down, stepped back, and realized it was just latent Dirichlet allocation (LDA), where “documents” are samples and “words” are mapped reads. I really like BUGS notation for models because it combines the ease of a graphical model presentation with the precision of a programming language. Note that the expression parameters theta and phi are scaled as ratios over reads. These values may be normalized by gene (or variant or exon) length (taking into account the vagaries of the mapping program) to molar units (by analogy with the number of reads being like weight). These models are really easy to fit and really easy to scale. As output, we get an estimate of the joint posterior distribution p(theta,phi|y,alpha,beta) over pathway expression and pathway composition (we just marginalize out the nuisance parameter t in the usual way by summation). The inputs are the hyperparameters alpha (the dimension of which determine the number of pathways T) and beta (determining the number of genes K), and the (ragged) input matrix y (determining the number of samples S and reads per sample R[s]). The output is a sequence of Gibbs samples. Each sample contains a value for all of the parameters: the source t of reads, the gene in pathway expressions phi and the pathway in sample values theta. We can just discard t to get a simulation of the posterior p(theta,phi|y,alpha,beta). As I discussed in our tutorial (and Griffiths and Steyvers discuss in the paper cited), the cluster assignments themselves in LDA are not identifiable. 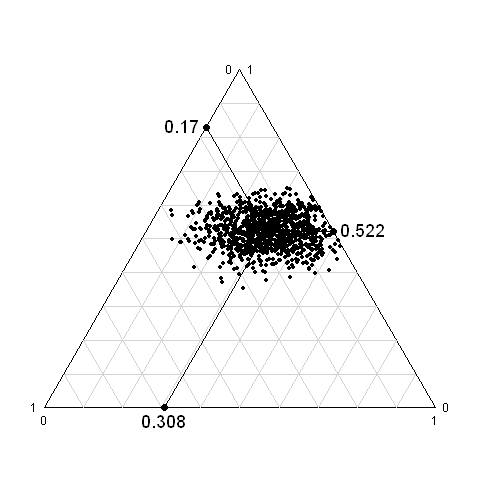 What we do get is a kind of random effects mixture model of correlation among genes. On the plus side, we can easily carry out multiple comparisons or other plug-in inferences from any derived sample statistics (such as pairwise or groupwise gene co-activation). Given that we’re usually using clustering like LDA as part of exploratory data analysis, we can just look at samples and topics and see what pops up. And if we have ground truth, as supplied at least partially by KEGG, we can look at whether or not known pathways emerge as “topics”. Inference is the same, at least in theory — there are just more variables to sample. The big difference is that now y has multiple constraints, so its conditional sampling distribution has to be worked out and simulated. BUGS does this kind of thing automatically. I’m still struggling with Casella and Robert’s Monte Carlo Statistical Methods. Just as I did for the hierarchical Bayesian model of batting ability and the hierarchical model of categorical data coding, with enough samples S that are in some sense exchangeable, it’s possible to estimate the priors alpha or beta in models like these. All the usual benefits accrue, like smoothed multiple comparisons. We just put a diffuse “hyperprior” on alpha and/or beta and include sampling for those variables. (Again, a bit easier said than done for those still working out all these simulations.) But again, it’s easy in BUGS. The Dirichlet prior only has a number of parameters equal to the number of dimensions and thus cannot fully characterize covariance of expected expression. A more reasonable model might be a multivariate normal on the logit scale. This is what Andrew Gelman suggested when I asked a while ago, and it’s only just sinking in. Another problem with the Dirichlet (and multivariate normal) priors are that they fix the number of clusters ahead of time. It’d be possible to plug in something like a Dirichlet process prior here. I’m not sure if the model it entails is reasonable. I’ll have a better idea after fitting some data. Well, OK, this post is just theory. But Mitzi’s already run the expression models I coded based on the previous post, and next up, I’ll try to convince her to run LDA on the data. When we have something ready to release to he public (warning: biologists tend to keep their data close), I’ll announce it on the blog. Barnett, John and Tommi Jaakkola. 2007. Topic Models for Gene Expression Analysis. Web page. Gerber Georg et al. 2007. Automated Discovery of Functional Generality of Human Gene Expression Programs. PLoS Comp. Bio. Flaherty, Patrick et al. 2005. A Latent Variable Model for Chemogenomic Profiling. Bioinformatics. Also, the Stephens Lab at U.Chicago (which brought you the awesome Marioni et al. paper on RNA-Seq expression (using Poisson GLMs) mention LDA, but in the context of population genetics. I introduced the problem of splice-variant expression from RNA-Seq data in my previous post on maximum likelihood estimates of RNA-Seq expression. In this post, I’ll show you a Bayesian approach to the problem from which we can compute a full posterior over the latent read mappings and relative mature mRNA expression of gene splice variants. For the purpose of this model, the reads are likely to be characterized in terms of the output of a sequencer, such as base calls with quality scores. , the prior read counts (plus one). The general-purpose parameter reflect how reads are generated, including the expected variation from the reference genome, the sample preparation process, and the sequencing platform’s error profile. The variation from the reference genome will determine indel and SNP rates, for instance using a probabilistically normalized affine edit distance model. Details of the sample preparation process, such as amplicon selection, fractionation technique, and so on, also determine which mRNA sequences are actually observed (through cDNA). Finally, the sequencing platform’s error profile, such as color confusability in image space, decreasing accuracy from the start to end of the read, and sensitivity to context such as the previously read gene (as in color-space dependencies in SOLiD or errors due to multiple copies of the same base). such that , the read expression probabilities. We select the expression levels based on prior counts. The heart of the mapping model is the discrete sampling of the latent mappings based on the expression level parameter . This is effectively a beta-binomial model of expression at the corpus level. The mysterious part of this whole thing is the channel model, which assigns the probability of a given read being observed given it arose from the splice variant under the sequencing model parameterized by . For purposes of illustration, we’re going to assume a really simple instance of this model. 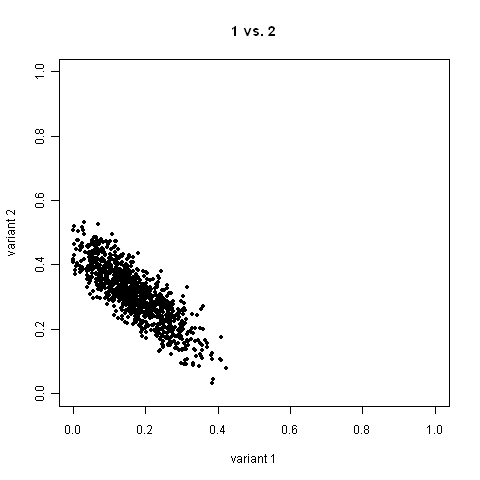 First, we’ll assume that for , which renders a uniform distribution over possible values of . With replicates at the sequencing run level (or even over channels for Solexa/Illumina data), we could build a hierarchical model and estimate . Second, we’ll assume a simple uniform read model. Specifically, we’ll assume that a read is just as likely to come from anywhere on the mRNA; a richer model would account for known variation due to the experimental procedure. Third, we’ll assume a mapping program that aligns reads with the reference gene models for splice variant sequences. If the mapper provides multiple reads, we will treat them all as equally likely; in a more articulated model, we would take into account both sequencing quality scores, the error properties of the sequencer, and likely variation such as indel and SNP rates in estimating the probability of a read given a splice variant. Although cross-junction splice mapping is straightforward to model versus a known reference gene model, we’ll restrict attention to exon reads here. The denominator reflects the number of positions a sequence of the given read length may occur in an mRNA of length . Although not scalable to RNA-Seq data sizes, it’s simple to investigate the properties of our model in BUGS. BUGS programs look just like the sampling notation defining the model; ddirch is the Dirichlet distribution and dcat is the discrete (aka categorical) distribution. I call it from R in the usual way. Here’s just the part where R tells BUGS how to run the model. After the BUGS window is closed, R plots and attaches the data. The other debugging problem I had is that you absolutely need to tell BUGS not to compute DIC (a kind of model comparison stat); otherwise, BUGS crashes when trying to compute DIC. Attaching the data converts the parameter of the model to matrix data representing the Gibbs samples. There are three exons, A, BB, and C, where the notation is meant to indicate the middle exon is twice as long as the others (to spice up the read calculation a bit). There are three splice variants, labeled var1, var2, and var3. Variant 1 is made up of exons A and BB, variant 2 of exons BB and C, and varient 3 of exons A and C.
Without cross-junction reads, it’s not possible to get a uniquely mapped read. Any read mapping to exon A will match splice variants 1 and 3, any read mapping to exon BB will match variants 1 and 2, and any read mapping to exon C will match 2 and 3. Next, we specify the number of samples drawn from each exon in each splice variant. There are three samples from variant 1, 6 samples from variant 2, and 10 samples from variant 3. These are distributed uniformly across the exons. Here, variant 1 has 1 sample from exon 1 and 2 samples from exon 2, variant 2 has 4 samples from exon 2 and 2 samples from exon 3, whereas variant 3 has 5 samples each from exon 1 and exon 3. If we adjust for length, variant 1 has 1 mRNA transcript, variant 2 has 2 transcripts, and variant 3 has 5 transcripts; these are computed by dividing by length. But our expression parameter theta ( ) is defined by reads, not by transcripts. The observed data is much simpler — it’s just the total number of reads for samples mapping to each exon. We see that there are 6 samples mapping to exon 1, 6 samples mapping to exon 2, and 7 samples mapping to exon 3. That is, there are 60 reads from exon 1, 60 reads from exon 2 and 70 reads from exon 3, and N=190. I tried to make this human readable: a sample from the first splice variant has a 1/3 chance of originating from exon 1 and a 2/3 chance of originating from exon 2 (because exon 2 is twice as long as exon 1). A sample from the third splice variant has an equal chance of being from either exon 1 or exon 3 (exon 1 and exon 3 are the same length). I ran the R program, which called BUGS, which terminated neatly and returned to R. The values were all pinned at 1.0, indicating good chain mixing and hence convergence of the sampler. We can compute any statistics we want now with the posterior samples. For instance, theta[,1] contains all the Gibbs samples for the variable . With more data, and especially with uniquely mapping reads (e.g. across unique junction boundaries or in unique exons for a variant), posterior uncertainty will be greatly reduced. 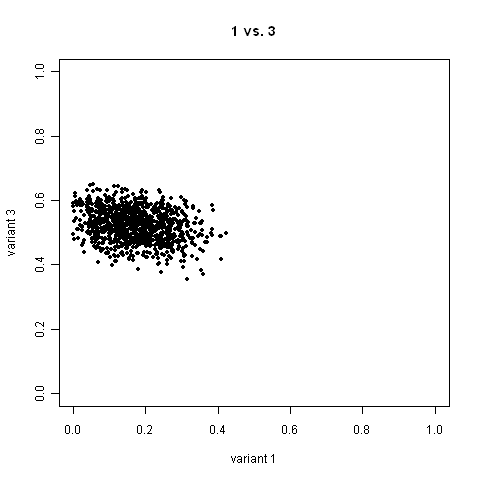 I couldn’t figure out how to label the axes in R’s ade4 package, but it’s clear from the means that are labeled that the upper left axis (mean of 0.17) is for splice variant 1, the bottom axis (mean of 0.308) is for variant 2, and the top right axis (mean of 0.522) for variant 3. 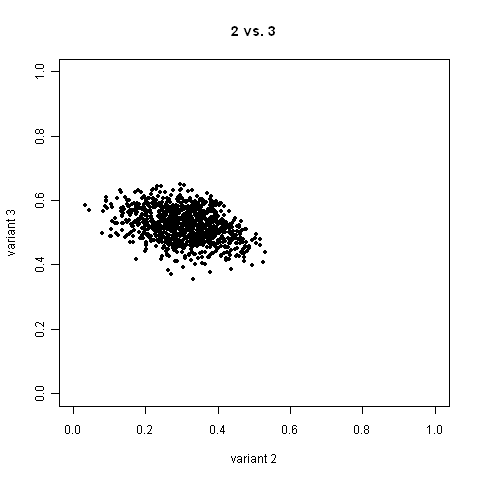 These show the strong negative correlation between estimates of the expression for variants 1 and 2, but little correlation between these and variant 3. This makes sense given variants 1 and 2 share the large exon BB. After getting carried away in my last post on this topic, Maximum Likelihood Estimates of Expression in RNA-Seq are Winner-Take-All Biased, I want to explain what went wrong when I “turned the crank” (an idiom in mathematics for solving an equation by brute force without thinking too much about it). 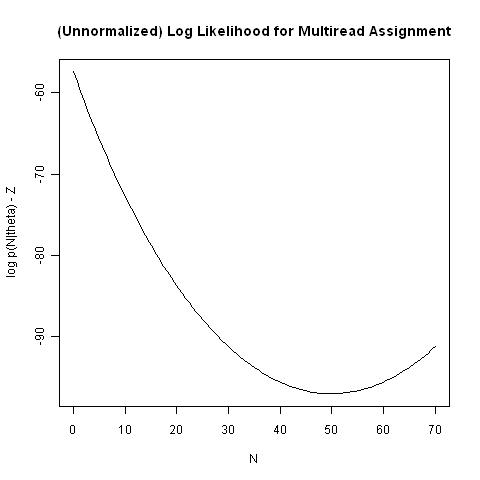 Maximum likelihood is usually stated as finding the model parameters that maximize the likelihood function consisting of the probability of the observed data given the model parameters. The problem is that there’s an implicit “except the latent parameters” inside the usual understanding the MLE. The 20 reads mapping to exon 2 must be part of isoform 1, and similarly the 50 reads mapping to exon 3 must belong to isoform 2. That leaves the 70 reads falling in exon 1 to spread in some proportion between isoform 1 and isoform 2. By assuming each splice variant consists of two exons of the same length, the probability of a read in an exon is 1/2 for each exon in the splice variant and 0 for the exon not in the variant. The reduction on the third line is because the probability of a read in the second exon, , is only non-zero for isoform , and similarly for a read in the third exon, where is nly non-zero for the second gene or splice variant, . The final reduction follows because . It turns out EM isn’t so biased for these discrete mixtures, at least when you turn the crank the right way.